Marlins Complex, Jupiter, Fla. Nov. 16, 2013 – They probably didn’t draw it up this way, but sometimes the road to a title has some unplanned twists and turns. That was certainly the case for Pete Thorne’s Athens Select. The team had already lost Fall Classic championship games in 2008 and 2010. This year they sneaked into the playoffs with a less-than-dominating 3-2 round-robin record that included a loss to the same Mueller Venezuela team they’d be facing in the finals. They even trailed 4-0 in their playoff game before winning due to forfeit. So, naturally, this was the Athens team to finally bring home a title. Behind the pinpoint control pitching of Justin Pannell, Athens Select held on for a 7-5 victory in the 25 Wood Bat Central finals. 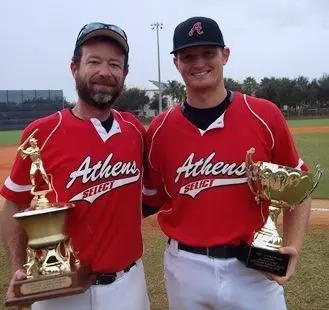 With Pannell on the mound throwing strike after strike – he’d finish with an incredible 80 strikes in 101 pitches – and Athens scoring four first-inning runs, it certainly was different this time around for a Select team that seemed to get better as the tournament progressed. Unlike in the team’s first game, an 11-2 Mueller Venezuela victory, Athens never trailed. Three consecutive walks to start the game put losing pitcher Denyersi Tovar in an immediate jam that was magnified when team co-MVP Kyle Melvin bounced a two-run single to right to score Rob Brown and Nick Pappas. An RBI ground out and RBI single later, Athens had a 4-0 lead it would never relinquish. Mueller Venezuela had manhandled five of six opponents during the week-long tournament, including a 9-2 decision over Nacionales Venezuelain a playoff game. That however, was with ace Reyes Azuaje on the mound. In two complete game efforts, Azuaje allowed just two hits and was scheduled to close the championship should his team have a ninth-inning lead. It never happened. Instead, Athens took a commanding, 5-1 lead in the third on Jeff Griffeth’s two-out RBI single to left. It stayed that way until the fifth, when Mueller Venezuela took its best shot. Octavio Belisario drove in a run with a sacrifice fly, before Nestor Marrero scored William Martinezfrom second with a single to left. When Fabio Castillo followed with a three-base error on a ball hit to right, the lead was down to one and Mueller Venezuela was back in the game. However, just as he would twice more, Pannell came up with the big pitch when needed. The big righty escaped further damage by leaving the tying run on third, then after Athens went ahead 6-4, and wiggled out of a one –out, first-and-second jam in the seventh. Brown’s RBI single in the eighth pushed Athens’ lead to three and proved significant when Mueller Venezuela threatened one last time in the ninth. With a light rain falling, a two-out RBI single to second made it 7-5 and put the tying run on base. Fittingly, on a day in which he dominated, Pannell got the final out on a comebacker to give Athens its long-awaited championship. For Thorne, Pannell’s effort was nothing short of brilliant. Brown and Melvin combined to go 5-for-8 with four RBI and three runs scored for Athens, which was awarded a place in the championship game when playoff opponent, Brothers de Venezuela, was disqualified for pitching former Houston and St. Louis (2005-2009) minor league pitcher Julio Cesar Castellanos. In the end, none of the distractions, past losses or forfeit victories mattered. For Thorne, this was finally a ride home for which he would enjoy.